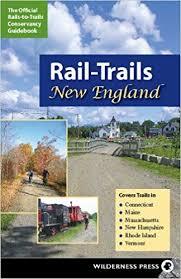 Over a thousand cue sheets and route maps for road cycling, mountain biking, rail trails, charity rides and cycling tours in New England, New York, Pennsylvania, Ohio, the District of Columbia, Virginia, New Jersey, Maryland and Quebec. About this site – The Bike New England site was started in the year 2000 by Gordon Harris while on a cycling tour across the United States. He also produces the site Historic Ipswich and is the Ipswich MA town historian. Your purchases through links on this site keep it going. For a $10 monthly fee your ad can appear in the side column of every page of this site. View details. Charity rides in New England - This list of fundraising rides is maintained by Bike New England and updated on a regular basis. Rides are displayed by state and in chronological order. Bicycle touring - For over 15 years we've headed out on week-long bicycle tours in the United States and Canada. These pages include the cue sheets, maps and route notes. Mountain bike rides in Southern New England - The New England Mountain Bike Association provides an extensive inventory of rides, maps and descriptions. Hiking and cycling trails on the Massachusetts North Shore - A large percentage of the North Shore area is protected, with marsh lands, state fores parks. Ipswich has been home to Bike New England since the beginning of the 21st Century. Bicycle rides in the Berkshires - The Berkshires of Western Masschusetts was home to Bike New England for thirty years, and offers some of best rides in the American Northeast. Quebec bicycle rides - With thousands of miles of designated cycling lanes and bike paths, nearby Quebec is a fantastic destination for bicycle touring.